May I say that this is the first December that has given me an authentic experience of … too hectic. I knew things were getting bad when my mother took me by the shoulders the other day in the kitchen and said: Please! Sit down and smell the roses, honey. The only roses I’m smelling lately come in the form of rose water, while I’m developing recipes for my book. I love that, but still, taking time to see the real thing and appreciate their beauty is what it’s all about. Mama knows best. So when my gingerbread boys ala cinnamon/no ginger worked out not at all for you, instead of making six batches to get them right, I stopped. 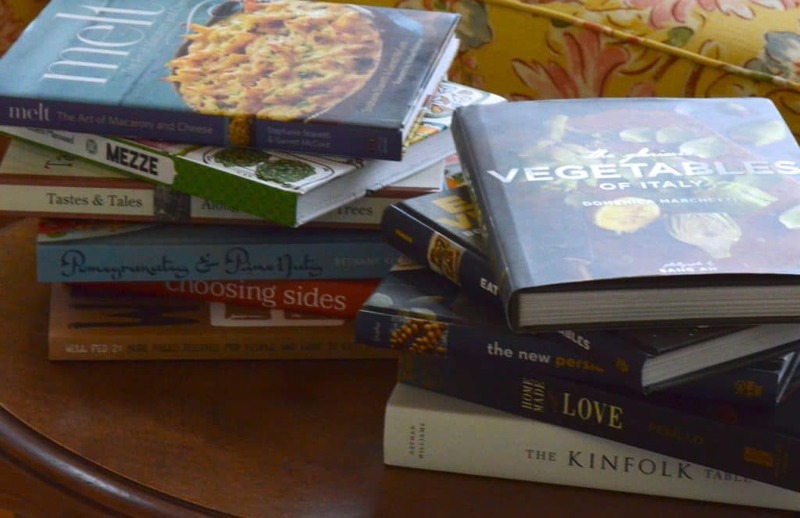 Instead, something else: Here’s a list of some of the wonderful new cookbooks out this year. Consider them for gifting yourself or others, if you haven’t already finished the job and are at your kitchen table smelling the roses by now—or just consider them special, and good to know about. I congratulate my many friends who are on this list. They inspire me with their creativity and the remarkable contributions they are making to the world! Melt by Stephanie Stiavetti and Garrett McCord. This is macaroni and cheese taken beyond the beyond. What heaven in a book and a gooey, luscious bowlful. Mezze, by Barbara Abdeni Massaad. Another great one from the author of Man’oushe and Mouneh. Not available in the U.S. yet, but it can be sent from Lebanon (see link). Tastes and Tales along the Tunnel of Trees. A community book from the good folks living Up North along and near the famous M-119, the “Tunnel of Trees” between Harbor Springs and Cross Village. Buy it locally from our dear bookseller, Between the Covers (call Katie at 231-526-6658; it’s also in lots of our shops around town). I’m the Guest Bookseller at Between the Covers this month; check it out here. The Glorious Vegetables of Italy by Domenica Marchetti. Everything Domenica touches turns to delicious. Her glorious books on Italian food and culture are must-haves, and her latest sings an ode to vegetables you won’t want to miss. It’s no surprise Domenica has Michigan roots! Pomegranates and Pine Nuts by Bethany Kehdy. A beautiful compilation of Moroccan, Persian and–yes!–Lebanese recipes. The New Persian Kitchen by Louisa Shafia. Such a lovely, well-written, thoughtful book of Persian cuisine from a super-talented chef and author who explores her Iranian culinary roots here. Eat Your Vegetables by Joe Yonan. These “bold recipes for the single cook” encourage us to treat our vegetables, and ourselves, with the TLC we deserve. Homemade with Love, by Jennifer Perillo. Just an all-around neat book that emphasizes the joy of cooking at home. This book comes from Running Press, the publisher of my book too. Kinfolk Table, by Nathan Williams. A big, gorgeous showstopper of a cookbook that is big on story, and people, and small gatherings…and the simple beauty those can be. Well-Fed 2, by Melissa Joulwan. What do you think of Paleo-style eating? No grains, soy, sugar, dairy, legumes, or alcohol. But still: “recipes for people who love to eat”! I know some Paleo devotees (Jim Casper, strapping jock) and it fascinates. Author Melissa has Lebanese ancestery, too! Bakeless Sweets, by Faith Durand. Strawberry Fool anyone? I think so, and all of the sweets in this delightful book. Choosing Sides by Tara Mataraza Desmond. Tara’s book is so much fun, because side dishes are the pleasure of the plate and the kitchen. We love her holiday salad with sugared cranberries…. 9 Responses to "2013 Cookbook Favorites"
Looking through great cookbooks is sort of like watching the Travel Channel. Only in stead of dreaming about visiting the world I think about what the recipe would taste like. And while I’ll never be able to afford to be a world traveler I can be a world taster. But even if I never get around to making the dozen recipes I mark in any given cookbook I had the experience of imagining the taste. Patty, thank you and I sure do remember our chat on the sidewalk last summer! I can’t wait to see your new kitchen. A lesson would be my pleasure! What a thoughtful list, Maureen. Thank you for including Glorious Vegetables. What really excites me, though, is learning about the titles I hadn’t heard about before ~ especially Mezze and Tastes and Tales Along the Tunnel of Trees. Thanks for bringing them to my attention. Wishing you a lovely Christmas and all the best in 2014. I can’t wait for YOUR book! Domenica, thank you! Much love to you and yours this Christmas and always! Thank you for suggesting these titles you are very resourceful.